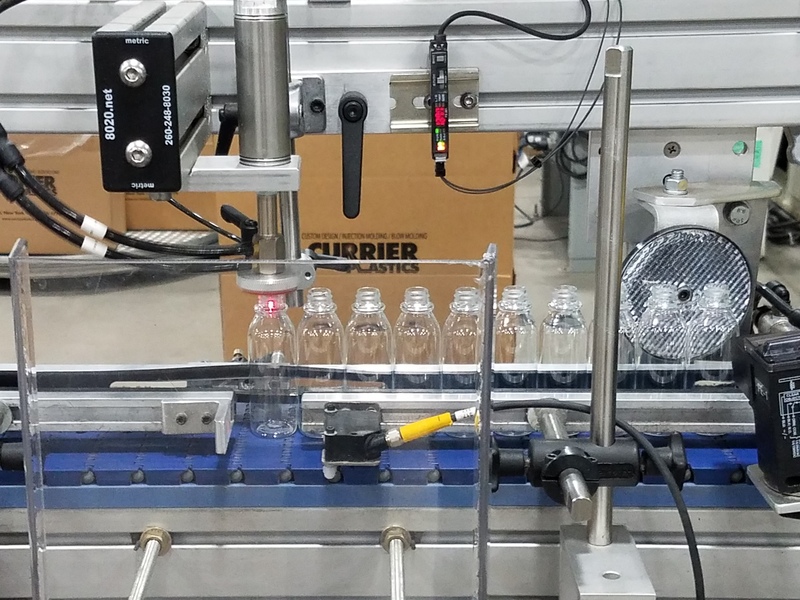 Currier Plastics produces a wide range of blow-molded bottles, containers and specialty parts in sizes ranging from 0.5 oz. to 1.5 gal. capacities. Our equipment features fully programmable controls and innovative material handling techniques to ensure repeatable processing and high-quality output for materials that include HDPE, PET, LDPE, PP, CPP, PVC, PETG, and PC. Our blow molding facility offers both Continuous Extrusion Blow Molding (EBM) as well as Injection Stretch Blow Molding (ISBM). We offer secondary decorating processes both internally and managed with our key decorating strategic partners. Our primary goal is to consistently engineer improvements to reduce your costs and increase your part quality. The blow molding group also specializes in glass-to-plastic conversion. By replacing glass with high-performance plastics, our customers can significantly reduce the cost and weight of many of their bottles and containers. 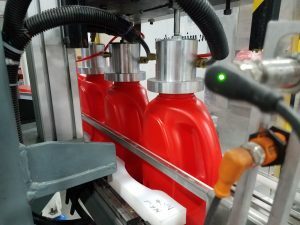 Secondary automation features a take-out system that orients each bottle to an upright position prior to the leak testing and vision inspection systems. The vision inspection system measures the neck dimensions to guarantee the bottles are in specification and that moils and tails detached properly. 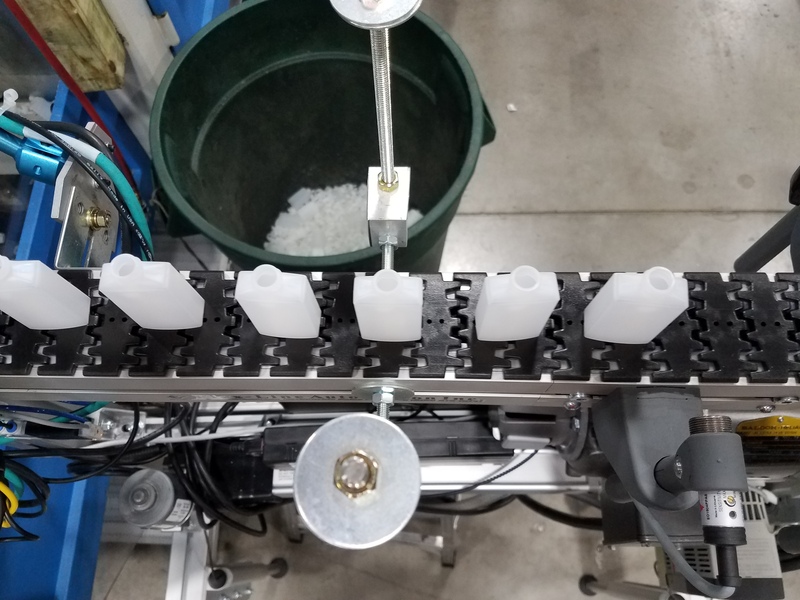 This secondary automation is one of the many ways we constantly improve our processing efficiency and maintain part quality. A specific resin is heated to the correct processing melt temperature. It is then extruded through a specialized screw and barrel in a solid stream that is converted to a hollow tube in the extrusion head that creates the “parison” that will be blown into the geometry that becomes the finished part. The parison diameter and length are determined by designing the proper tooling and process requirements. At this point, the blow molds close around the parison, pinching off the bottom of the part and at the same time the parison is cut at the top of the mold by a knife and held in place. The blow-pin assembly then enters the parison to form the inside diameter while pressurizing the cavity to form and cure the finished part. Once the newly formed part has formed and cooled, the flash is removed from the top and bottom by a punch system. The unused plastic on the top and bottom of the part is segregated to be ground and reintroduced for processing. All excess material is reprocessed into the material stream as PIR, or Post Industrial Regrind. The machine takeout system takes the finished part out of the machine for leak checking and packaging. PET resin is conveyed and dried in a specialized drier to reduce dew point to the proper processing state. After drying the material, it is conveyed into a screw/barrel to bring the material from a solid state to the required process melt temperature. The resin is then injected into a hot runner manifold to distribute the resin equally to the injection cavities where the preform is formed over the core rods. The preform resembles a test tube and contains all the plastic required to make the part. The neck finishes and part weight can be held to precise tolerances. While in the injection mold, the preform is conditioned in targeted locations to prepare them for the stretch blow station. Once the preform has been conditioned, it is rotated to the stretch blow mold. Here the preform is biaxially oriented using a pneumatic stretch rod and high pressure air to create the part geometry. Once the part is formed, the mold opens and the parts are rotated to the ejection station for downstream inspection and secondary operations and then packaged for shipment.